Stradbally is a pretty village in Co. Waterford on the south coast of Ireland. This website has pages for a number of local clubs and organisations as well as general information which may be of use to visitors and those around the world who have emigrated from Stradbally. Time and more details to follow. 2015 July Thursday evenings....the very popular Thursday Evening Local History tours have recommenced. Come along to the Barron Hall and a new topic will be covered each night. 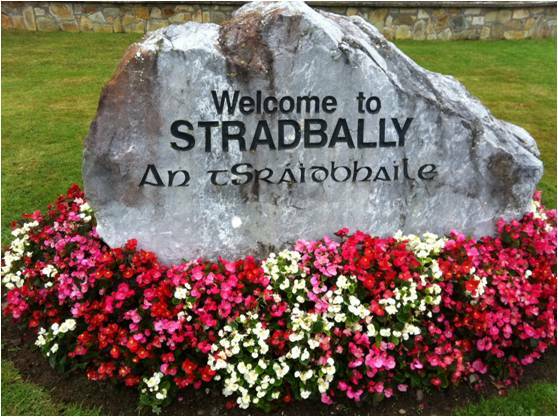 Please keep Stradbally looking pristine, the Tidy Towns Committee members are busy getting Stradbally ready for the 2015 Tidy Town's Competition. 18th July....St. James Field Day, come along to St. James's for the ever popular annual field day. A day filled with fun and activities. 28th - 31st July....​Annual Soccer Summer Camp for boys and girls 7 to 13. This camp fills up very quickly so sign up soon. 26th July Sunday......GARDEN PARTY AND FAMILY AFTERNOON AT WOODHOUSE... Visit the beautiful walled garden and marvel at the extensive renovations done on the House over the past two years by Jim and Sally. And many other activities...€10 entrance, all proceeds to four different charities. 2pm to 5pm. Graveyard Masses....take place on Wednesdays as follows.....8th July Ballylaneen, 15th July Faha, 22nd July Stradbally. 90 years ago on the 15th of February, a Spanish(or more correctly Catalan) Ship sailing from Barcelona to Liverpool called the Cirilo Amoros(Loving Girl) drifted off course and ended up wedged on the rocks in Ballyvooney. Fiesta reigned in Stradbally for the following months with wine flowing and spanish dancing every night. New citrus fruits were on the menu for Stradbally residents for months after. Waterford(Déise) Greenway passing through Stradbally parish being constructed presently which should give exciting tourism opportunities to Stradbally.